My wife, daughter and I spent a week in Portugal, based in Albufeira for a week from 21st April. Although I am a keen birder the rest of the family likes to do other things so we weren’t focusing on birds only. Our hotel was at Praia de Oura about a mile from the centre of Albufeira. We didn’t like it and if we go again we would try and stay in a more rural location. But it was close to the sea and there were a couple of small wooded valleys within easy walking distance. I had early morning walks while the family slept in and saw a few interesting birds such as Spotless Starling, Serin, Sardinian Warbler, Yellow-legged Gull, Gannet, European Bee-eater, Hoopoe, Alpine Swift and quite a few Iberian Magpies. The last were a surprise to me as I had expected to have to search quite hard to find them. 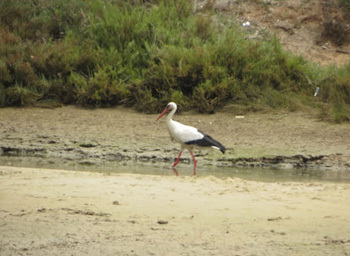 I don’t think that I failed to see at least one on any day that I was in the Algarve. 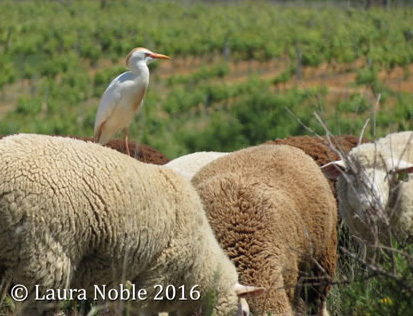 We used A Birdwatchers' Guide to Portugal, the Azores and Madeira Archipelagos by Colm Moore, Gonçalo Elias and Helder Costa (Prion 2014) as our site guide. The directions were reasonably clear and up-to-date although it would have helped to have some more detailed maps in the book. We used a smart-phone for navigation and the combination of that and the book was just about OK.
For those who have not been to Portugal before, the driving is fairly relaxed. People were patient with me as I hesitated at crossroads. The speed limits were completely mystifying and as far as we could tell largely ignored! Parking was never an issue. 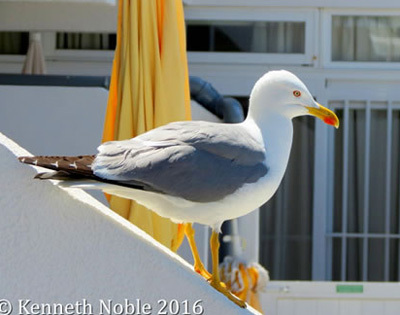 The first outing we did was to Quinta do Lago, just to the west of Faro, on 23rd April. We found the ‘rough track’ referred to in Moore & co but rather than following it we parked in the grounds of the nearby golf club. No one objected and it was handy to be able to buy drinks and use the facilities. 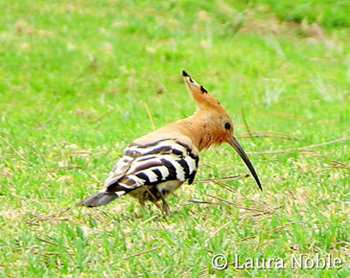 Near the car we had excellent views of a feeding Hoopoe. Assuming that we were in the right place, we didn’t see any sign saying ‘discovery trail’ but following the rough track for about a km brought us to a large lake with a massive hide overlooking it. 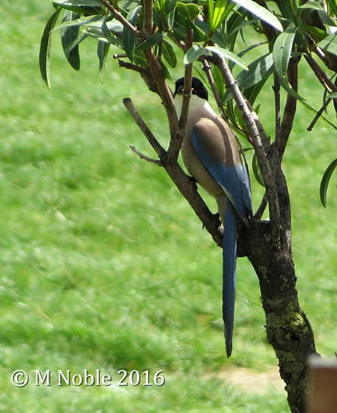 (We saw quite a few Iberian Magpie and a couple of European Bee-eater along the trail.) 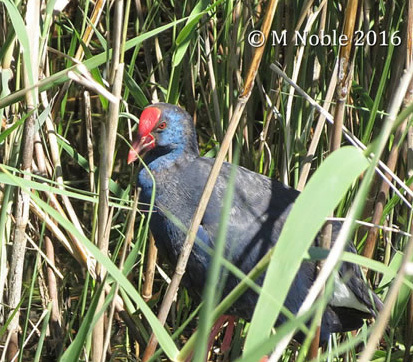 We didn’t bother with the hide as Western Swamp-hens were wandering across the golf course. 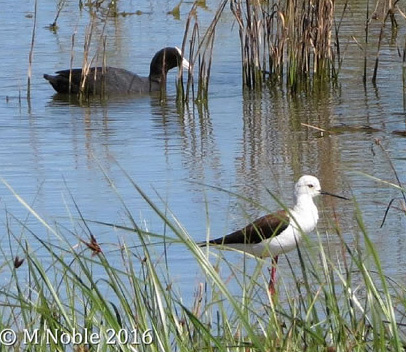 We could see Coot, Black-headed Weaver, Common Pochard and various other waterbirds but, somewhat to our surprise, we discovered that we were on the end of a large, well-marked reserve consisting of a tidal estuary and salt-marshes (not mentioned in the guide book). There was another, smaller hide, looking across this area and a well-made path heading approximately towards Faro. 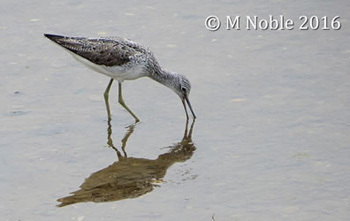 We saw a good variety of waders, including Turnstone, Greenshank, Whimbrel, Grey Plover, Ringed Plover and Sanderling as well as White Stork and Little Tern. There were a few Yellow Wagtail and a Lark which I assume was Crested. There were Red-rumped Swallow in the area, too. We didn’t walk very far but clearly the area had great potential. On 24th we drove up to Serra de Monchique, a serra being a range of hills. 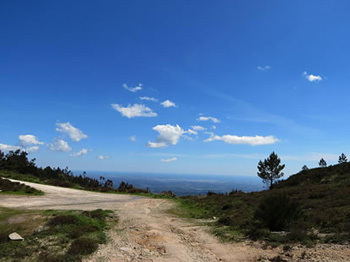 We didn’t see much in the town (White Wagtail) but decided to drive higher up the hill towards Fóia, at 950m the highest point in the Algarve. We stopped before the summit at a little lay-by and explored on foot. The vegetation was very scrubby. It was one of those places where you could hear more birds than you could see. The only definite sightings were Rock Bunting, Nightingale and Stonechat though I’m pretty sure that a raptor that flashed past was a Sparrowhawk. I could see two distant raptors which looked like buzzards. 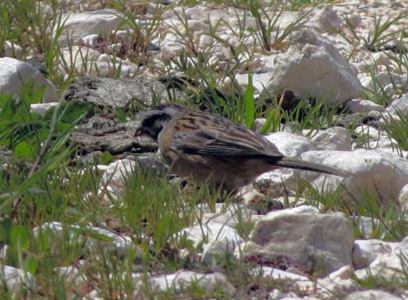 Rock Bunting habitat at Fóia. This is the view to the West and the sea could be seen in the distance. This point is probably about 850m above sea-level. The next day we visited the historic capital of the Algarve, Silves. There were lots of swifts but I’m afraid I never managed to figure out which! The same applied to a Kestrel although it must surely have been Common. 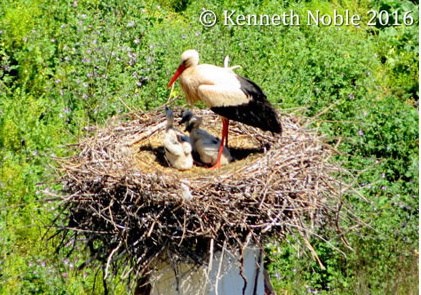 The main highlight here was lovely views of nesting White Stork from the castle battlements. Our last major outing was to Lagoa dos Salgados on 26th. 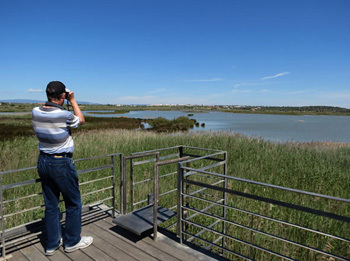 This is my idea of birding heaven – masses of birds, a great boardwalk, some ‘blinds’, a very nice café (near the beach), other birders to compare notes with, sunny weather but not too hot, and also plenty of wildflowers, butterflies a terrapin etc. I am 99% certain I saw a Lesser Emperor Dragonfly with a vivid sky blue base to its abdomen. The birds just kept on coming. 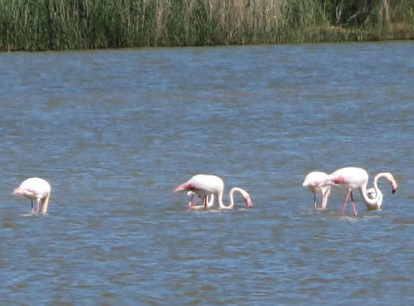 First, I finally connected with the hoped for Greater Flamingo, about 12 of them, and not too distant. I also saw an adult Audouin’s Gull – in among the masses of Yellow-legged and Lesser Black-backed gulls. Other highlights were Black-winged Stilt, Avocet, Western Swamphen, Ruddy Shelduck (although it may have been a hybrid), Whiskered and Little Tern, Purple and Grey Heron, Cattle Egret, Little Egret, Little Bittern, Kentish Plover, Crested Lark, Fan-tailed Warbler, European Bee-eaters (close), Hoopoe, Iberian Magpie and even a Common Sandpiper. I think I saw a Spoonbill flying past but I was too busy looking at something else to verify it. 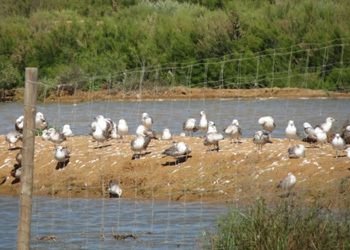 Some of the hundreds of gulls at the Lagoa. Most were yellow-legged but there were other species among them. That was pretty much it, bird-wise. 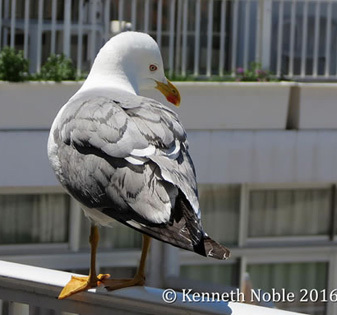 But I’ll finish with a couple of shots taken at the hotel – and a list of birds seen.